Born in Ahwaz, Persia, Sabzi started painting at the age of twelve; encouraged in his early progression as an artist by his parents and inspiring teachers. Sabzi earned a Bachelor of Science in Agricultural Engineering at the University of Jundi Shapur. "The best part of agriculture was the purity of its primal spaces," Sabzi says, explaining his early sensitivity to artistic concepts. Sabzi's early works were primarily realistic, exploring the historical and cultural themes of his homeland. Sabzi's departure from Iran during the Khomeini regime brought him to Germany and then the United States. This exile provided Sabzi the opportunity to explore new artistic influences. Sabzi, an abstract expressionist, almost always paints women beautiful, graceful, taciturn and melancholy; they reflect love, mystery and solitude. Sabzi's women are Madonnas, modern goddesses and martyred saints whose elongated forms suggest instability and internal conflict. According to Sabzi, their anonymous faces make them into religious icons that transcend and defy the demands of reality; reflecting warmth, charm, happiness, and his undisputed love and admiration for women. 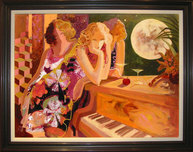 Sabzi's paintings resonates both Eastern and Western philosophies. 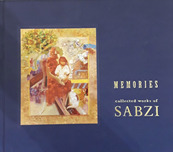 Sabzi's rich Persian heritage provides Sabzi with ancient images, sentimental Persian themes and memories of innocence. 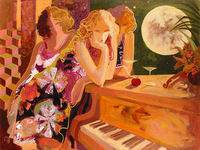 Sabzi draws from the Western influence of modernism found in the works of Klee, Cezanne, Matisse and Bonnard. Remember every time you purchase Sabzi artwork over $995, shipping is FREE in the continental U.S. and there is NO SALES TAX when you purchase outside of Colorado. We SHIP WORLDWIDE and offer Layaway for Sabzi art.